This vegetarian goodness was warmly welcomed after a weekend of splurging for Charlotte Restaurant Week. Friday night we went to BLT Steak and Saturday night we went to Sullivan’s. Both meals were delicious but very indulgent! I taught BodyPump on Saturday morning and was very excited to have a great crowd! Love seeing people up and knocking out their workouts on Saturdays. Later that morning Brandon and I headed over to Y2 Yoga for a power 1 class. Saturday was Yoga Day USA so I couldn’t miss out on practicing! I headed over to Y2 again today for hot yoga. I’m happy to report that I practiced 6 out of 7 days this week! After yoga I was famished. This dinner was so easy to put together and a nice change from all the steakhouse dinners we enjoyed this weekend. Honestly, it wasn’t my favorite curry that I’ve ever made but was still very good. My favorite vegetarian curry is still this Butternut Squash Curry which also happens to be from Gourmet! Heading to bed early tonight…teaching BodyPump at 6 a.m. tomorrow. Heat oil in a 3-4 quart heavy pot over medium heat. Add onion and cook, stirring occasionally, until edges are golden, about 6 minutes. Add ginger and garlic and cook for 1 more minute. Add cumin, coriander, turmeric, salt and chili pepper and cook, stirring, 1 minute. Stir in water or broth, lentils and coconut milk. Bring to a simmer and then cover and cook for 5 minutes, stirring occasionally. 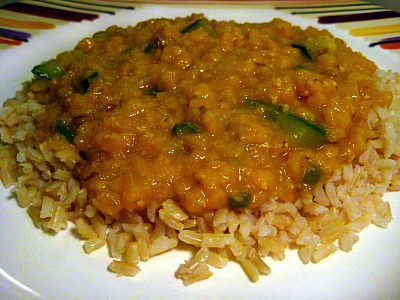 Stir in zucchini and simmer, covered, until lentils and zucchini are tender, about 15 minutes. Season with salt and serve over rice with cilantro sprigs scattered on top. I love curry – the Butternut Squash is fantastic too. I’ll have to try this one. Gourmet has good curry recipes! 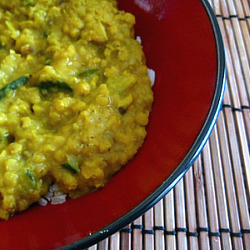 I’m a fan of curry and a new lentil lover, so i can’t wait to try this! Yum…I love Indian food! Looks awesome.